Comments Off on What is Food Sovereignty? Food sovereignty is a social movement that fosters community resiliency by localizing food production and consumption. The Food Sovereignty Movement (FSM) is a strategy for historically marginalized groups to reclaim their rights to food autonomy as they face displacement and economic injustice caused by globalization. 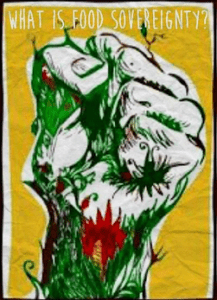 From the destructive implications of the “Green Revolution” to the destabilization of subsidence agriculture by cheap foreign imports, the Food Sovereignty Movement is about civil resistance to neo-imperialistic control over food. The movement is led by a myriad of groups, from immigrant farmworkers to indigenous populations, who all possess the same desire: to reclaim the right to their food system and land. Food sovereignty action manifests in many ways, for example, it can take the form of resistance against “…[the] development of golf courses, intensive shrimp farms, large pig barns, or eucalyptus and palm oil plantations” (Desmarais & Nicholson, p.5). Leaders of the movement are organizing for the power to decide what they eat, who produces it, and what influences their local environment, food system, and economy. Through strategizing around food, activists work to protect their cultures and livelihoods from the homogenizing force of global corporate power. Different communities domestically and abroad pursue justice using a variety of tactics including: fostering local food production, engaging in community education and outreach, developing place-based economies, restoring their historical right to land, creating labor unions, and achieving policy reform. The foundational document of the movement, The Principles of Food Sovereignty, emphasizes locality, sustainability, and the preservation of culture. Activists strive to close the gap between consumer and producer and construct a food system where skills and resources are shared (often using democratic decision-making). The Principles also assert that food should be produced using sustainable methods and follow one’s own traditional methods of harvesting, as opposed to the input-intensive methods powerful economic actors impose upon them. In regard to its movement strategy, the FSM prioritizes horizontal collaboration and solidarity organizing in order to “globalize the struggle, and [bring about] global hope”(“Globalize the Struggle, Globalize Hope!”). A prominent group of the Food Sovereignty Movement is La Via Campesina, an international coalition for small-scale farmers working organizing together to protect their right to economic security, cultural identity, and dignity against corporate influence. La Via Campesina was founded by a group of farmers in 1993 in response to the negative impact the General Agreement on Tariffs and Trade (GATT) international trade policy had upon small producers. Currently, the coalition consists of 163 organizations around the world striving to counter neoliberal policies and create food justice, economic autonomy, gender equity in their respective communities. In the United States, the Detroit Black Community Food Security Network is a member of the U.S. Food Sovereignty Alliance (USFSA). The Detroit Black Food Security Network was created in 2006 to improve Detroit’s different Black communities’ right to food security and justice. Created in response to the growing influence of white activists trying to improve food insecurity in the area, the Detroit Black Community Food Security Network formed in order to develop Black leadership in their own neighborhoods’ pursuit for food justice. The Detroit Black Community Food Security Network advances food sovereignty in Detroit through advocating local policy change to address food insecurity, developing the infrastructure for local food production and creating buyers’ clubs and food cooperatives. From La Via Campesina, an international coalition for landless farmers to the Detroit Black Community Food Security Network, activists today are expanding the movement by building a strong global base. Fostering community resilience in spite of corporate oppression, the groups of the Food Sovereignty Movement demonstrate that resistance is alive and well.